1. 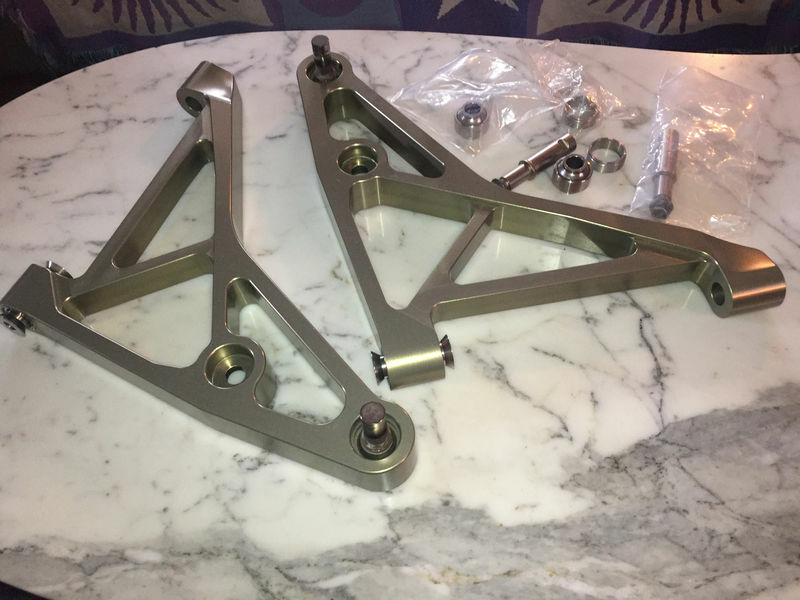 "Charlie Arms" Billet Aluminum Control Arms -- 944/951 early offset (fits through 1986); USED, in MINT CONDITION; These are the real deal -- strong, beautiful, and considered to be the absolute best 944/951 control arms. I bought these used. They were originally sold by Powerhaus, fitted with 17mm pins for use with stock spindles. Wrightwood Racing (designer/manufacturer) recommends 19mm pins for lowered cars, especially if tracked. While the 17mm pins and original monoballs seem to be in very good condition, I purchased a new set of 19mm pins, monoballs w/nuts, and gland nuts from Steinel for $360. They are included in this sale. I really want to use these on my car. 2. KW Variant 3 Coilover Suspension Kit #35271010, BRAND NEW still in box; Fits '86 - '91 all 944/951; Adjustable stainless steel struts/shocks complete with springs and ride-height adjustable perches, made in Germany, TUV approved; The rears are designed to be used along with the torsion bars, which should be re-indexed to achieve the desired ride-height range. I bought these as the ultimate street/track combo. A search of rennlist will result in numerous threads about the V3 kit for 944s/951s. I really want to use this kit on my car. $2,400.00 (Current price is $2,804.99 from a variety of sources.) SOLD! 3. CPRacing (CPR) Street Splitter -- 944S2/951; BRAND NEW, never installed, with mounting hardware; ABS splitter replaces the stock "batwing"; Much more durable than fiberglass; Can be painted; There are numerous posts on rennlist if you search the 944/951 forums. https://rennlist.com/forums/944-turbo-and-turbo-s-forum/481322-cpracing-v1-splitter-pics.html; This was a very popular item even after the two limited production runs ended. Mine is from the second run. Here's your chance to get a brand new one. (I guess it's now NOS and otherwise unavailable.) The first pic is from a CPR post on RL. The second pic is this splitter for sale. 4. 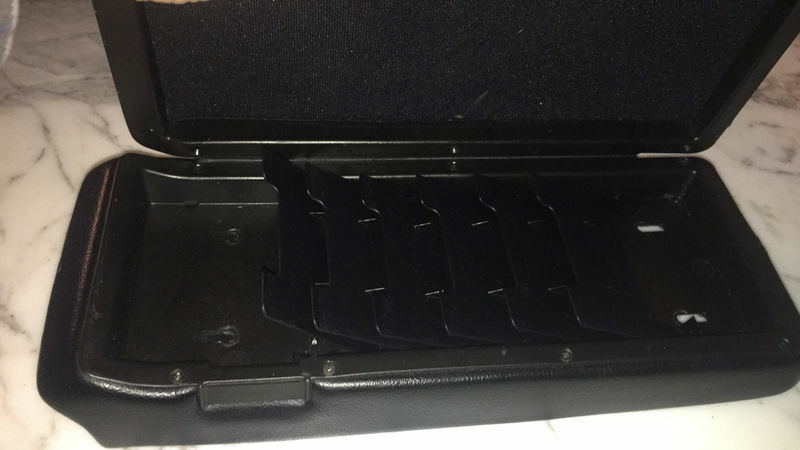 A-Pillar Double Gauge Pod -- BRAND NEW, with mounting hardware; Fits 924S, 944 from '85/2, 944S, 944S2, 951, 968; From Lindsey Racing; Replaces the left side A-pillar interior trim and holds two 2-1/16" gauges; Black, but can be painted to match your interior. The first pic is from Lindsey Racing. The second is this pod for sale. 5. 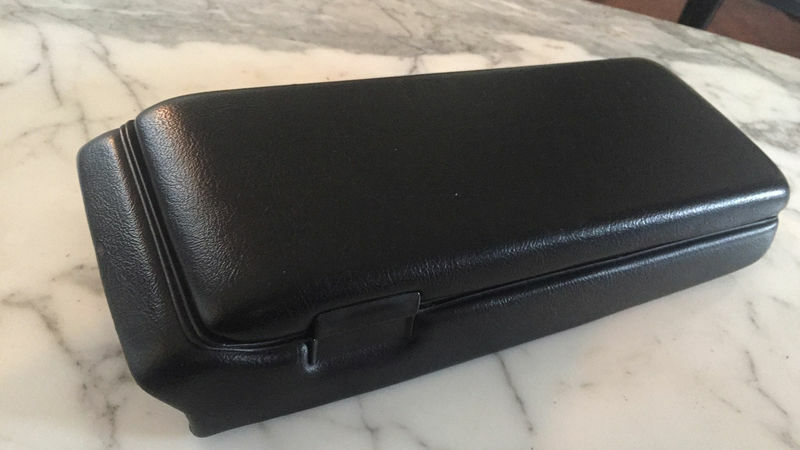 Cassette Box/Center Armrest -- USED in VERY NICE condition; Fits EARLY 944 (unlike many of the parts listed); I bought this to replace my late 944 (951) box but it was erroneously listed as late 944 and was in such good condition. As it turned out to be the early type, I couldn't use it. It's complete except for the screws which hold the lid to the hinge (which is in excellent condition). You can use the screws from your old box. 6. Genuine Bosch 69429 Fuel Pump -- BRAND NEW in original box; I bought this pump as a high volume replacement for the stock fuel pump. This pump delivers a higher volume than the stock pump, but not much as the famed "044" pump often used with larger than stock injectors. The stock fitment for this pump is for several models of Volvo and is now discontinued. I'm glad I bought it when I did. Please see my other posts (parts 2 & 3). Last edited by cb951; 03-19-2019 at 01:55 PM.. 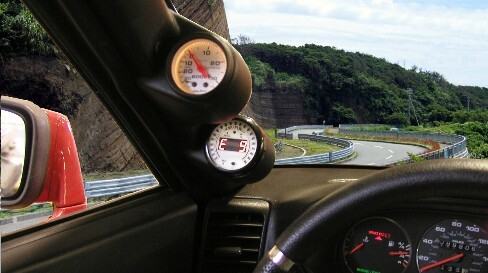 Sent message regarding the A-pillar gauge pod. 1986 Porsche 944 Turbo Project. 2000 Toyota Solara...boring to drive but good mileage. 1971 VW Super Beetle...sold it to make room for the Porsche.